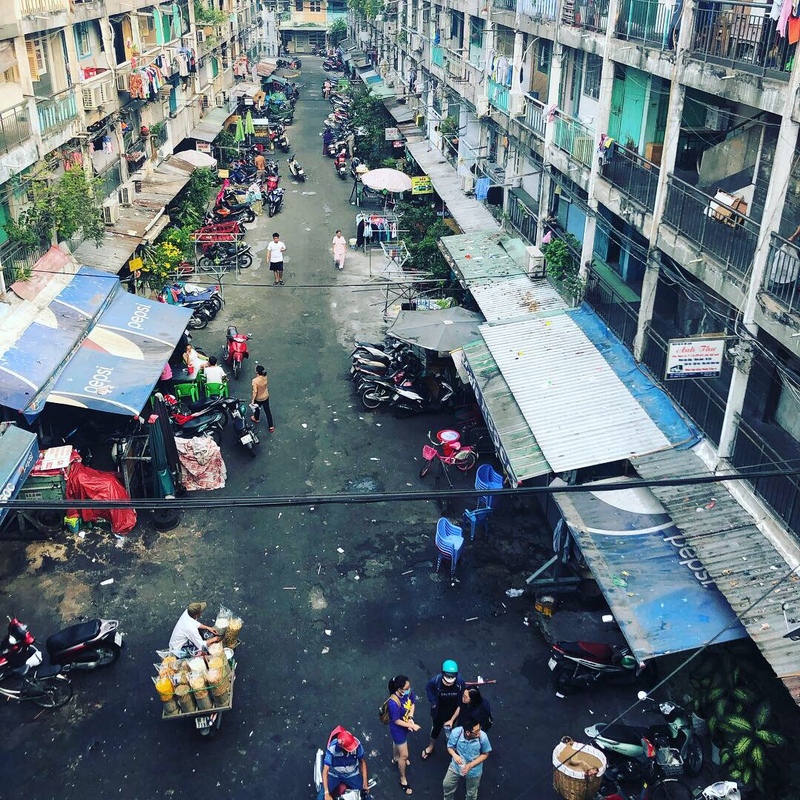 In 2013 tonemanblog lost a library of photographs leaving many broken links on older posts. 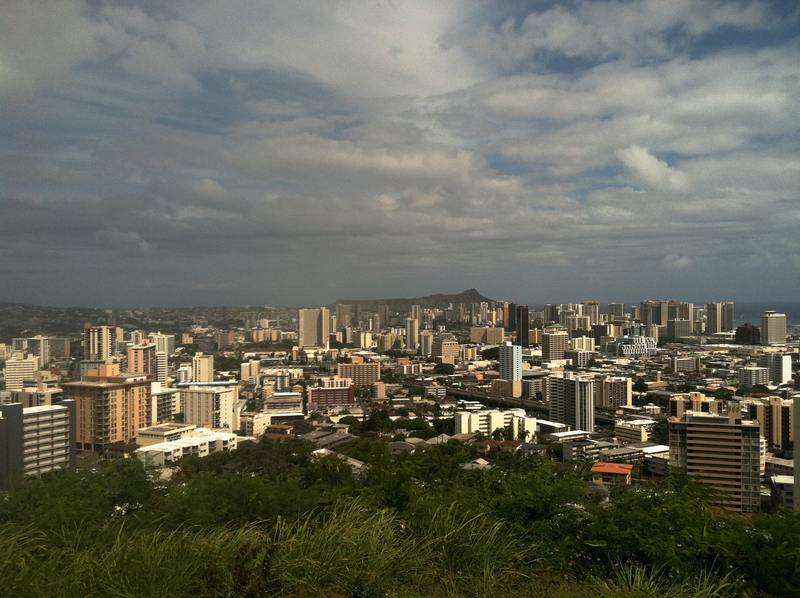 The following post is a restored version from a trip in 2011 trip to Hawaii. Today began on the beach–our own private beach in a lagoon that for whatever reason was almost empty! The water is blue and the perfect temperature. The sun is bright. The beginning of each day includes a ritual of SPF 50 on the body and SPF 100 on the face (and in my case the dome). Forget the iPad, it’s so bright you would have to be in the shade to read a book on it. It is not, however, particularly hot. In fact, the temperature never varies more than 15° all year long! We spent time at the beach and then sought out some local food. I have been reading about Hawaiian food and it’s casual and not particularly healthy, but a sort of island soul food. We found it at a place called Hawaiian BBQ. 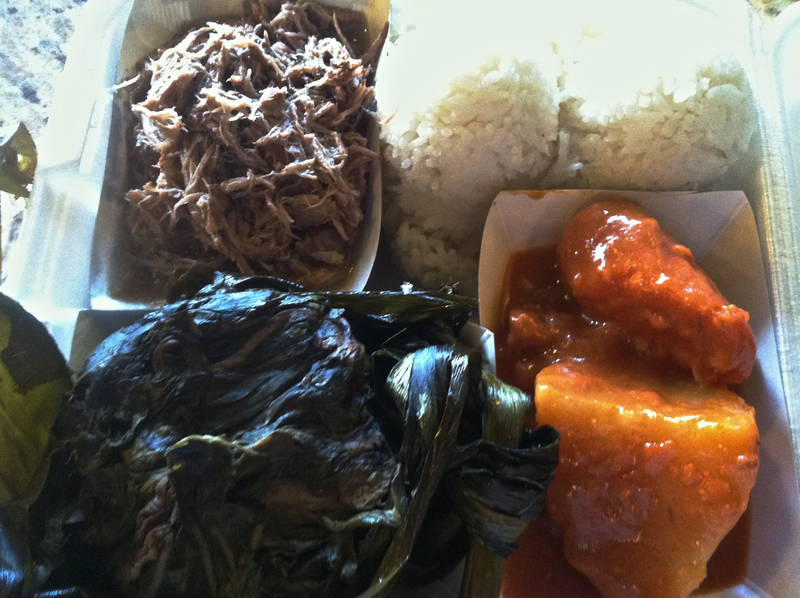 The Hawaiian Sampler, clockwise from top left: Kahlua pork, haupa rice, Hawaiian beef stew, and a lau lau. The food was fantastic, but enough to feed 6 people. I knew I was in trouble when they handed me the styrofoam container and it weighed about 3 lbs! It contained Kahlua Pork, the Hawaiian version of pulled pork. That is amazing bbq! Next to it was haupa rice which is a combination of brown and white rice. Haupa she told me means “mixed”. There was beef stew which seemed out of place but the veggies were local and the beef was braised like short ribs. There was also an item called a laulau. This was braised pork wrapped in banana leaves and steamed. It was sort of like a tamale, and sort of like a Polish galumpki. It was packed with concentrated flavor and possibly my favorite item on the platter. 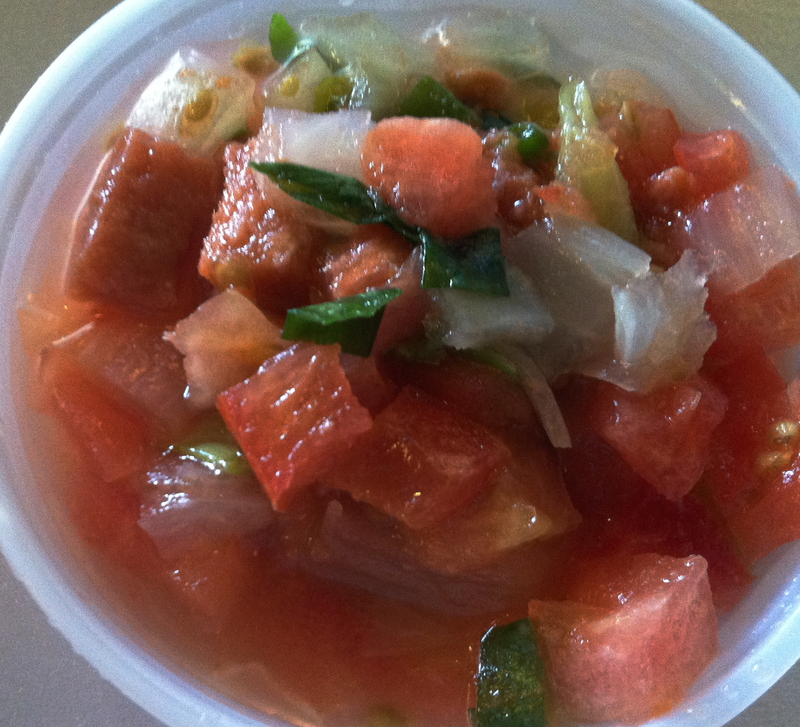 The Lomi lomi is a distinctive Hawaiian preparation for salmon. Beside the platter was a small cup of Lomi Lomi. This is a salmon dish and apparently way back when, sailors brought salmon to Hawaii to trade and they created this unique preparation. This is something I want to recreate when I get home! It was ceviche meets salsa and used very fresh Alaskan salmon. From there we drove to the National Cemetery of the Pacific at the Punchbowl Crater. If you have been following the blog through this trip you know we did a day of reflection on Memorial Day. 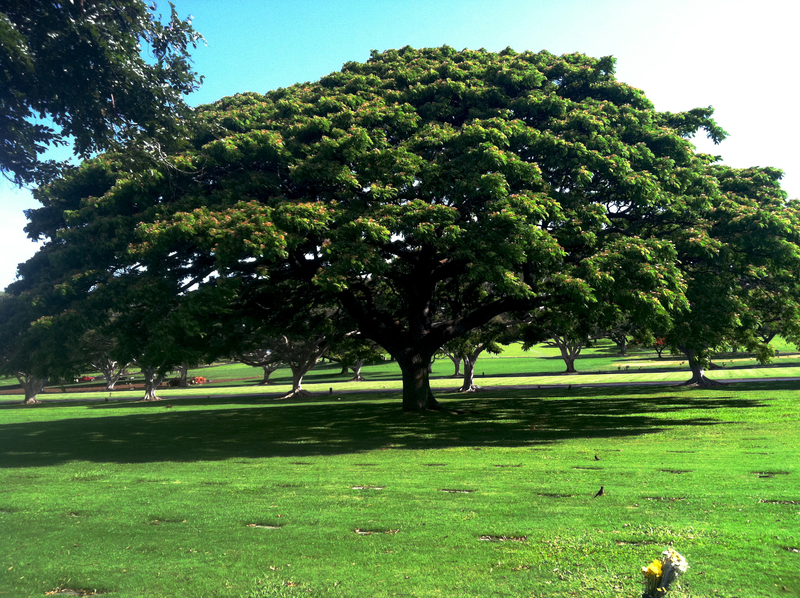 It’s not that we needed more time to honor the fallen, but this is one of the most beautiful spots in all of Oahu! Once again it is a volcano that collapsed in on itself forming a giant bowl at the top of the mountain. This bowl was used to create a 116 acre national cemetery. 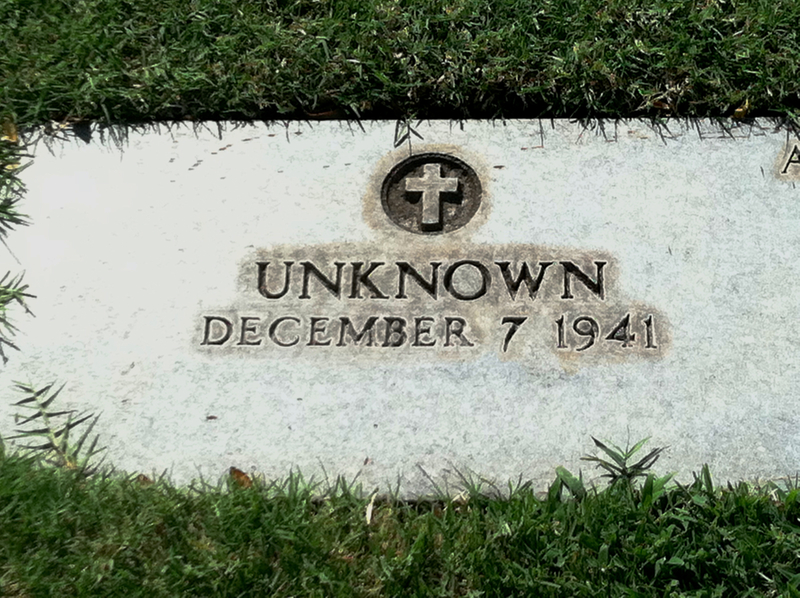 The very first stone was an unknown soldier who died on Pearl Harbor Day. Plot A-1 at the National Cemetery of the Pacific, an unkown soldier who died on Pearl Harbor Day. The cemetery is a peaceful beautiful place and anyone would enjoy it. There are spectacular old hardwood trees and the rim of the crater offers 360° views of the island. The flowers are everywhere. More impressive in a roadway median than many well-landscaped lawns back home. 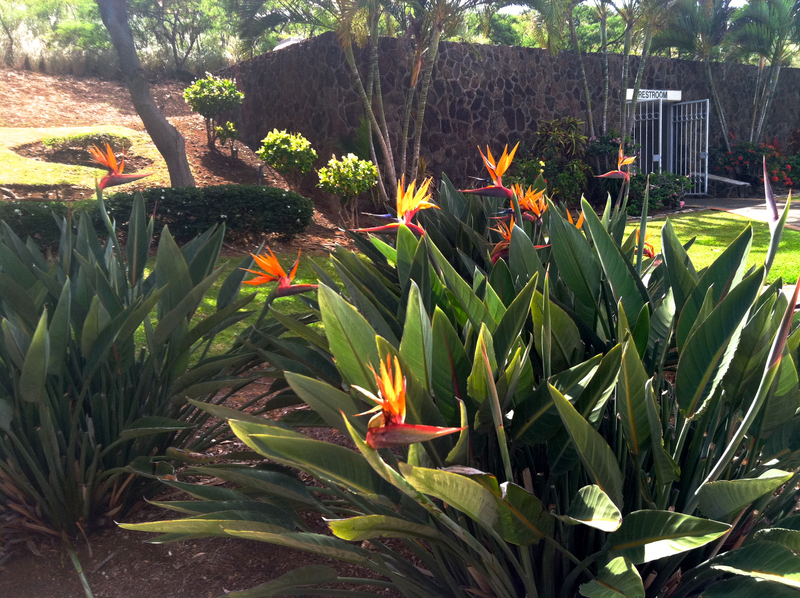 This grove below had Birds of Paradise and there were so many! Birds of Paradise; one more glorious view from the Punchbowl Crater. 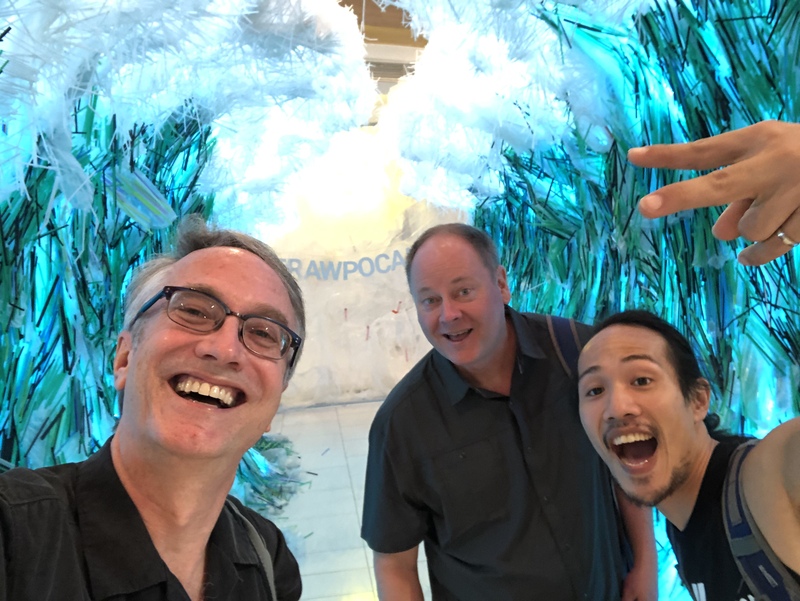 After this visit we went back to the resort to get ready for dinner at Roy’s Ko Olina. 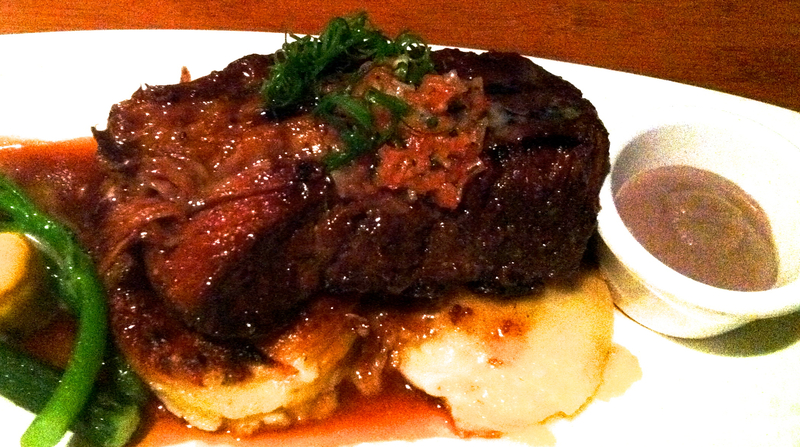 This is Hawaiian fusion cuisine at its best. Roy’s combines Asian cuisine with European and American cuisine all using regional ingredients and the result is the finest meal we have had here yet! My wife had a sampler appetizer plate which included Ahi tuna sashimi that has basically ruined both of us from mainland sushi forever! 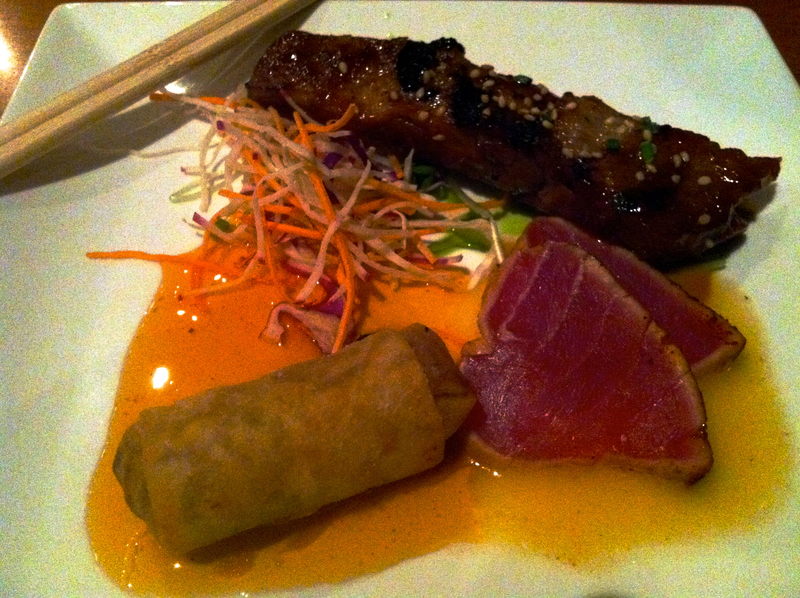 It also came with a spring roll and a Mongolian spare rib, both of which were very good. The Ahi Poke with roasted garlic and chilis in a rice paper bowl. My appetizer was one of those about which I would have gloated if I were in a bigger party. 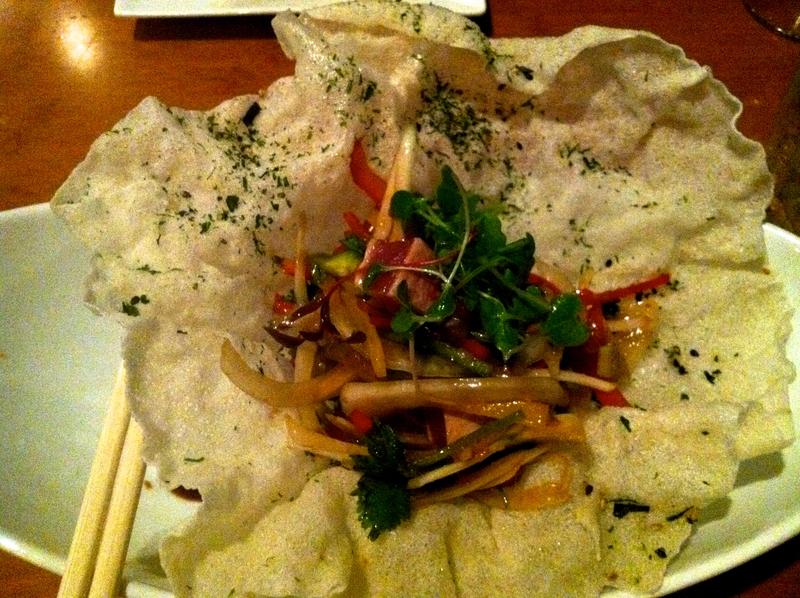 It was Ahi tuna poke mixed with roasted garlic and chilis in a rice paper bowl. The first bite left me breathless. After a week of eating really well this was the best thing I had eaten all week! The roasted short ribs with poi (an acquired taste). For the entrée my wife had the roasted short ribs. These were reminiscent of Sunday dinner at Grandma’s, only better. The poi was served on the side because as the server said, “it’s an acquired taste”. As it would turn out, we did not acquire this taste and the poi went largely untouched. 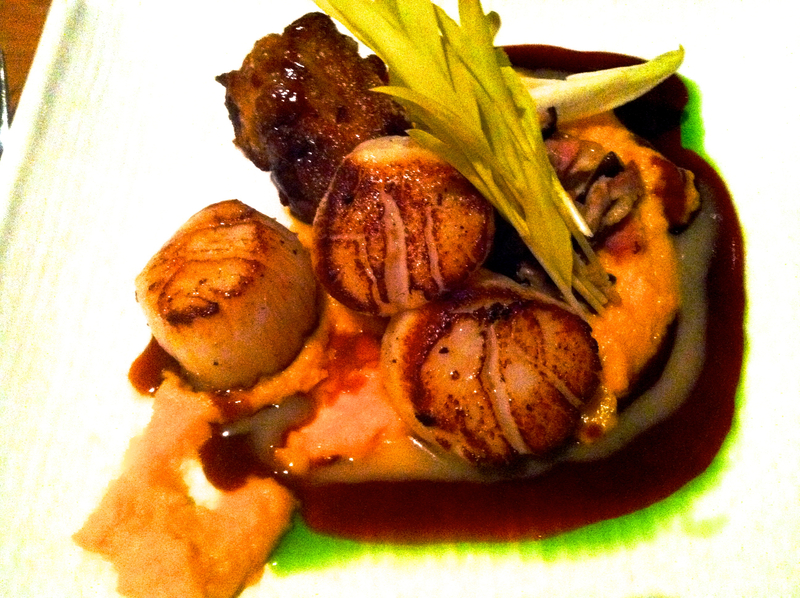 The Seared scallops with crispy pork belly served with local kobocha squash puree, natural juices, and scallion oil. When my entrée came I thought I would have to find a room to be alone with it. It was huge seared scallops and a pork belly confit on a puree of local kombocha squash with natural juices and scallion oil. Again, one bite made me close my eyes and try not to moan out loud! It will be difficult for any restaurant to top this meal as it was a beautiful setting and fantastic food and service. Roy’s private labels several very good wines and Greg, our excellent server was great at recommending wine pairings for each course. We have one more full day left in Oahu before heading to Maui and it’s hard to believe we could top a day like today.